Blogging is the way to sharing your knowledge with the world of people for that you can earn money blogging from advertisements or affiliate programs or selling your own products, what ever tell your blog readers just tell truth in blogging, otherwise you know very well what will happen? For instant your target will achieve, you will think like this, but after few time probably today or tomorrow your target will see for you like never achievable. In blogging or any business do not think that you will make 1000$ of dollars in a day that is not possible in the beginning time of doing blogging as well as in business, see real business need time to grow and blogging is a completely real business, you need to give time to grow it, that's why your blog tips will stand in a very good place in the market means in the search engines, if your blog posts will stand in the search engines results in very good place then definitely you are going to very good traffic and traffic equals money, right! Just you need to promote right product in your blog to your blog traffic or readers. Truth is Important? But Person Matter! Today, I was talking with my neighbor friend, he is in business from last few years, he told me he was planning to go Australia for job and travelling both for six months but not now, after few months, but here is the thing he has shared with me. For any work he went out side from home town, that's why he told his younger brother to handle his business, but after he came back he got complaints from customers for not satisfaction of services, probably his brother was good even then my friend customers only believe on my friend not on his brother! I think it make sense to you, so make your own identity in the internet, if you want to succeed in the internet that's why people will believe on you on your blogging niche! Don't Try to Make Fool of Any One "Online"! See online is the biggest market place in the world, the reason is quiet simple according to Google, three trillion people search on Google every day, each day. Then what about others search engines(Yahoo, Bing, Ask, Baidu)! Now probably you are getting me, really internet is the biggest market place in the world, but the thing is that to maintain those people, I mean, how much people you can attract to your business blog or website? There two good ways to get those people to your blog, one of them is free of cost(From search engines) and another one is paid advertising! Now straight come to the heading, why am I saying this "Don't Try to Make Fool of Any One "Online"! 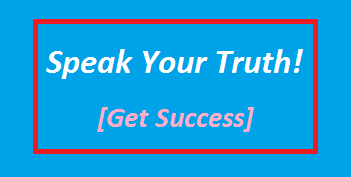 Because truth unveil quiet fast online, so if you lie about anything now, then probably whom you lied or misguiding he or she will come to you about you within few days, then what will happen dear, you will loose visitors the most important is trust of people, don't let it happen for your blog(You). Simple speak what you know, that is important in blogging! I know you want to succeed in blogging business, but don't be hurry to become a successful blogger, just keep blogging with quality and stick to your blog topics, these will definitely help you to make money blogging.